Well—the final word is in on whole grains and health, and it’s all good news. Researchers from New South Wales just reviewed some massive studies that were completed over the last few years. In all, 11 major clinical trials established the link between whole grain cereal consumption and substantially lower risks of type 2 diabetes, coronary heart disease, and hypertension. These reduced risks have led the researchers to establish some clear guidelines around the ideal amount of whole grains that should be consumed, the nature of whole grains, and the potential mechanisms for the effect of whole grains on health. First, to maintain health, you should have 40 grams or more of whole grains every day. This is about a bowl of whole grain breakfast cereal daily. This should be easy enough to do—though according to the research team, 80% of the population doesn’t achieve this goal! Secondly, aleurone in bran is a critical grain component generally overlooked in favor of fiber. Live aleurone cells store minerals, protein, and the antioxidant ferulic acid; and the benefits of aleurone cells to one’s health go above and beyond those benefits gleaned from eating fiber alone. Finally, the researchers suggest that magnesium, zinc, and ferulic acid each potentially play a role in the prevention of chronic diseases, including heart disease and diabetes. There are all sorts of whole grains you can choose from to get your one bowl a day. In fact, you could have a different whole grain every day of the week, while at the same time boosting your aleurone intake. 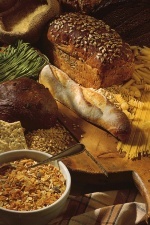 Get helpful tips on making sure that the food you buy really does contain whole grains. Neal, A.L., et al., “Whole grains, type 2 diabetes, coronary heart disease, and hypertension: Links to the aleurone preferred over indigestible fiber,” Biofactors January 28, 2013.